evaluation and interdisciplinary team training. 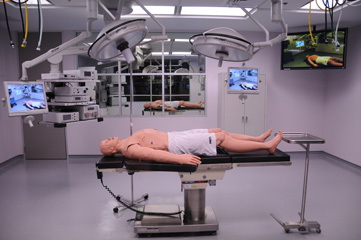 The Learning Center provides a large array of both high fidelity and low fidelity simulation equipment, to support innovative, multidisciplinary and inter-professional education of healthcare students and professionals living in Louisiana and the Gulf Coast region. The Learning Center houses multiple simulation suites and state-of-the-art audio-visual technology within the Isidore Cohn, Jr. MD Student Learning Center and the Russell C. Klein M.D. ('59) Center for Advanced Practice. Education and training activities engage learners in active, competency-based, hands-on learning and provide explicit opportunities for reflective and deliberate practice and feedback. The Learning Center is supported by faculty members and staff who have specific expertise in teaching/learning effectiveness, curriculum and instructional design, program evaluation and performance-based assessment. The Learning Center is a natural laboratory for scholarly work in teaching, learning, and assessment and a vehicle for attracting and retaining outstanding medical educators at LSUHSC-NO.